Plans to cut Welsh MPs by more than a quarter would "fundamentally undermine democracy" in central Wales, a Conservative MP has said. Glyn Davies said the loss of his Montgomeryshire seat would "destroy centuries of history". Finalised plans propose cutting the Commons from 650 to 600 MPs, with Welsh MPs cut from 40 to 29. Mr Davies told BBC Radio Wales it was "anti-democratic" to cut the Commons while the Lords increased to 800. Speaking on Good Morning Wales, the Conservative backbencher claimed the drive to "cut the cost of politics" had been sparked by public outrage at the scandal over MPs abuse of their expenses. Parliament backed the idea in 2011, but it was shelved when the Liberal Democrats fell out with their Conservative coalition partners over House of Lords reform in 2013. As a result, the 2015 and 2017 elections were fought on the same boundaries as 2010. While cutting the overall number of seats, the changes are also aimed at making the size of their electorates more equal, with between 71,000 and 79,000 voters per constituency. "I think we do need to equalise our constituencies, but not as narrowly as is being proposed now," he said. "This is simply a response to the expenses scandal from ten years ago - to cut the number of MPs with no rationale. "But people dislike MPs to such an extent that there'll be some support for this." Mr Davies said the changes were particularly damaging to the interests of rural areas. "Parliamentary democracy in mid Wales will be pretty well eliminated, which would be very disappointing to me - it's a great part of Welsh history." Monday's final report from the Boundary Commission for Wales confirms proposals for splitting the constituency of Montgomeryshire, with the northern part merging with South Clwyd and the southern portion with Brecon and Radnorshire. The boundaries, which are the same as those proposed in 2017 but with some name changes, would also result in the loss of Cardiff Central, and see the two Newport seats cut to one. A proposal to create the constituency Ynys Mon a Fangor (Anglesey and Bangor) has been amended to spell it as Ynys Mon a Bangor. Plaid Cymru claimed the review was "the latest example of Westminster trying to diminish Wales's voice". 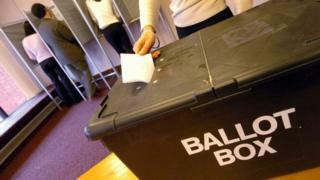 A spokesperson said the party's priority was a Welsh Assembly "fit for purpose with the proper powers and capacity". Video How Wales Works: Welsh MPs - what do they do?